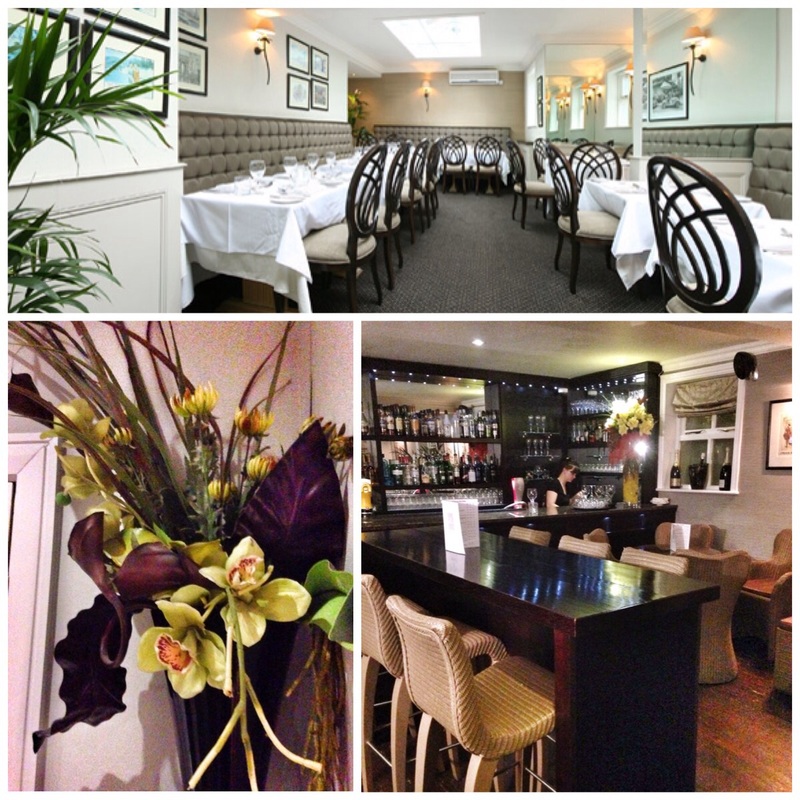 Before I worked in Manchester, the only place I ever went for a special occasion was La Boheme in Lymm. 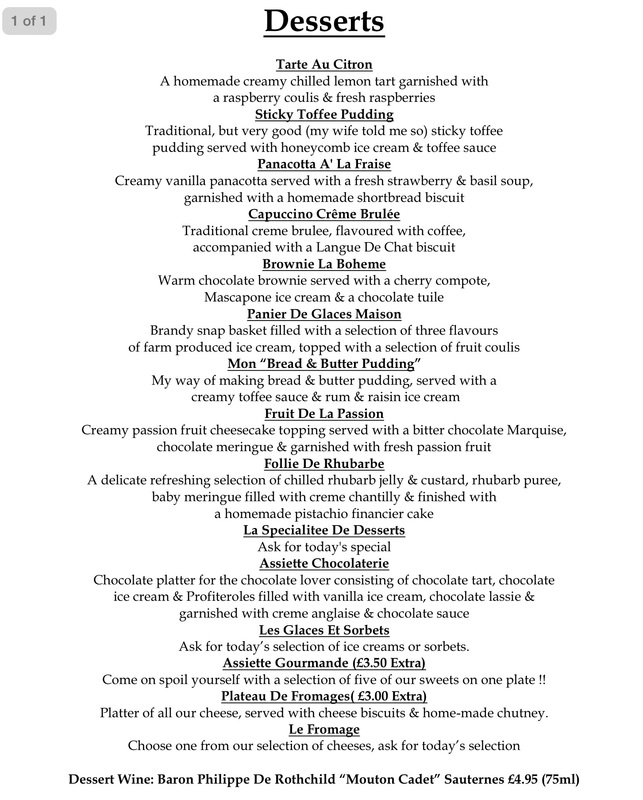 Birthdays, anniversaries, christenings…you name it La Boheme was THE place. 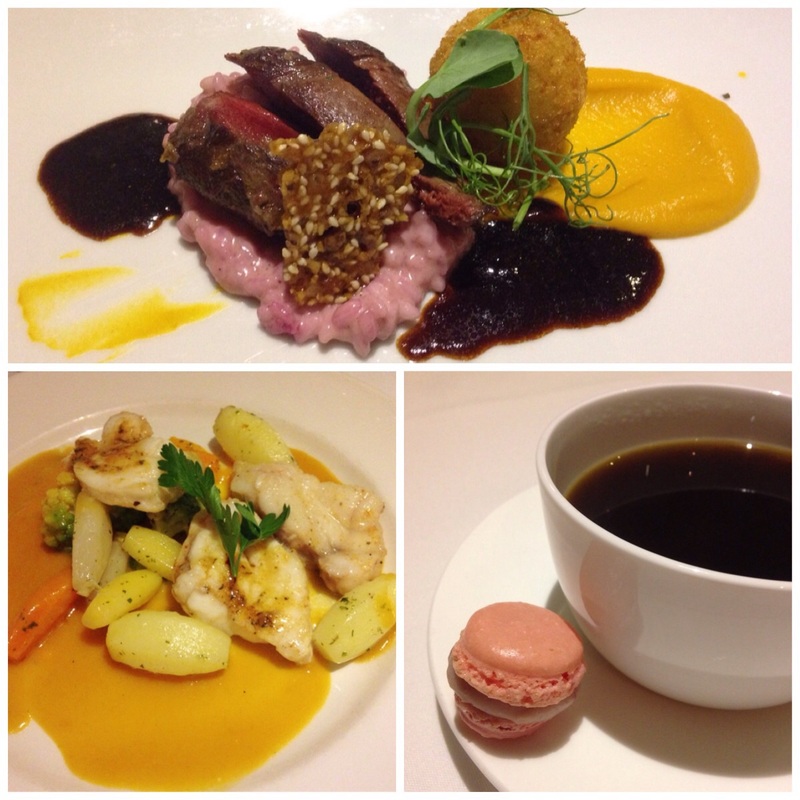 French cuisine delivered with a British twist is its game. In some respects it’s been largely forgotten (by me), so it was with a welcome smile that ‘little sis’ announced that the family would be trooping back to celebrate Mum and Dads 54th Wedding Anniversary. The eight of us waltzed into the old house on a chilly Wednesday night. The place hadn’t changed. The white frontage and fret cut logo was still there. We ventured into the bar and settled down to a pre-dinner drink. I think elegance is the word. Dark wood, sage banquettes, cream coverings matched to a series of Parisian black and white images create a comfortable and safe atmosphere. The odd display of fresh cut flowers adding a further flourish. We had a large round table for our party, superb for eight. We each took a large leather bound volume to survey the incredibly extensive menu. I recall Gordon Ramsay in one of his ‘restaurant helping’ programmes advising on a simple menu. “Prepare everything through the day” he preached, so that all that was needed at service time was a quick flash under the grill or a final dunk in boiling water. Chef Olivier Troalen must have eight arms and an ability to levitate to make this menu happen. 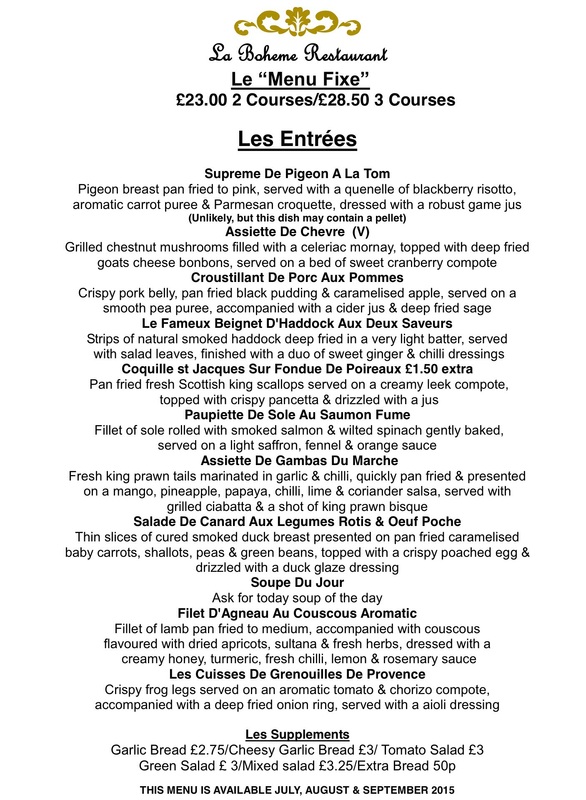 There are at least twelve starters and twelve mains as well as specials to go at. The place is packed. 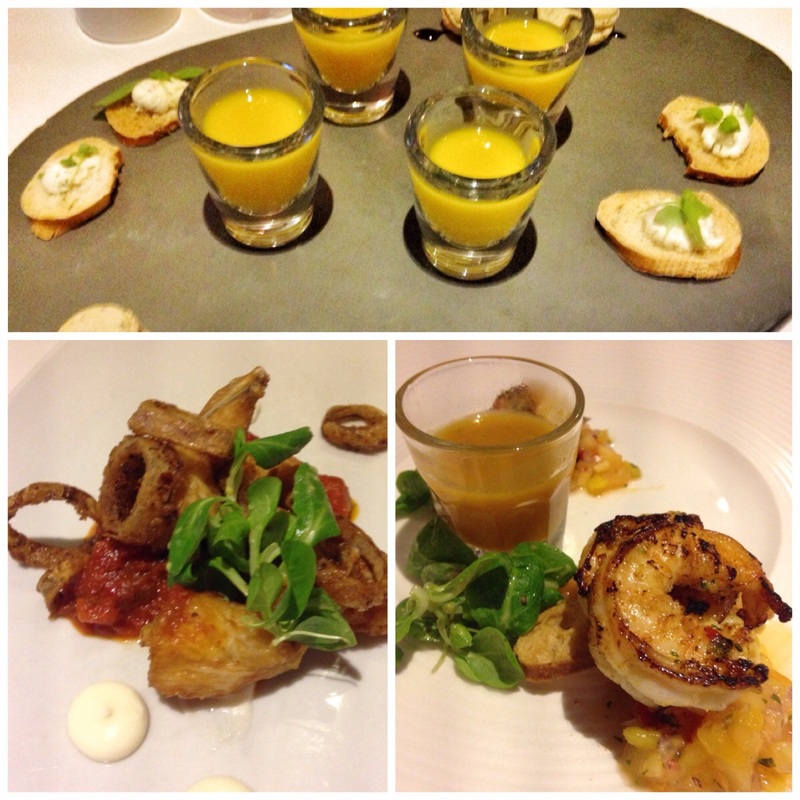 Each dish has several ingredients and is presented beautifully and consistently. 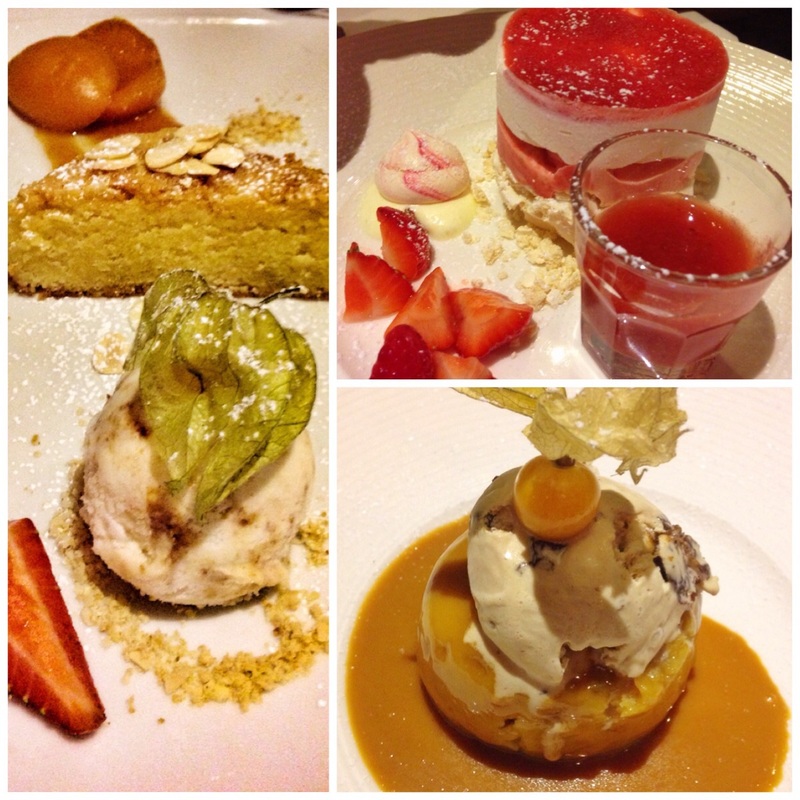 12 Starts, 12 mains, 14 desserts! First up some ‘yellow’ canapés. Carrot and coriander soup was one. Savoury macaroons featured. Great start. The entourage went for a variety of starters, too numerous to mention here. I had the pink pigeon breast or ‘Supreme De Pigeon A La Tom Pigeon breast pan fried to pink, served with a quenelle of blackberry risotto, aromatic carrot puree & Parmesan croquette, dressed with a robust game jus (Unlikely, but this dish may contain a pellet)’ to give it its full name! The Flame won with an ‘Assiette De Gambas Du Marche’ i.e. Fresh king prawn tails marinated in garlic & chilli, quickly pan fried & presented on a mango, pineapple, papaya, chilli, lime & coriander salsa, served with grilled ciabatta & a shot of king prawn bisque. I managed a slug of prawn with chilli, wonderful. The young nephew munched through frog legs (Les Cuisses De Grenouilles De Provence Crispy frog legs served on an aromatic tomato & chorizo compote, accompanied with a deep fried onion ring, served with a aioli dressing). He proclaimed it a revelation. 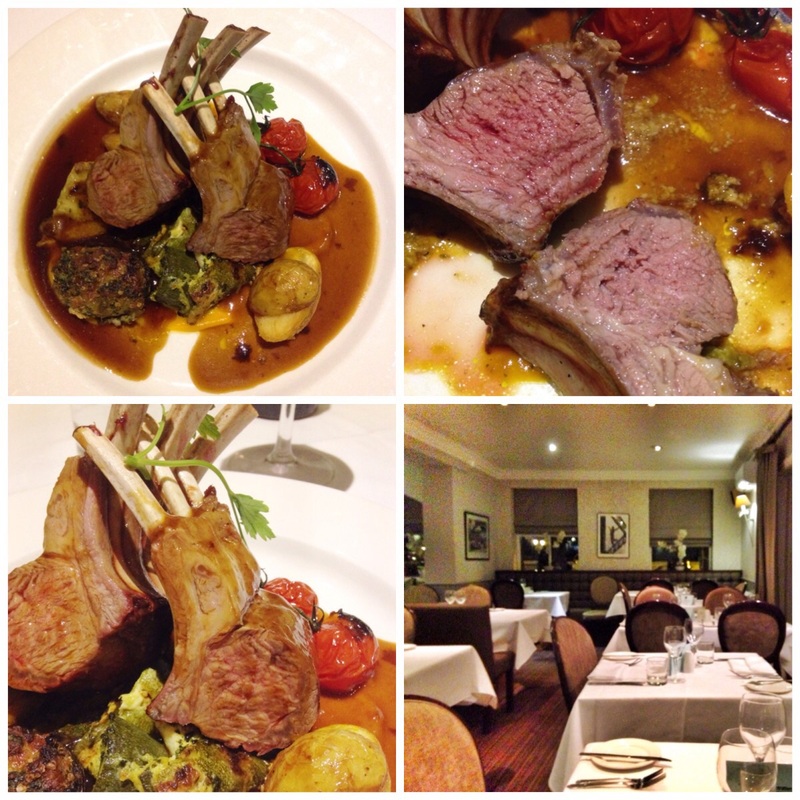 Main next, I went lamb again (see Cartford Inn! here). ‘Carre D’Agneau Du Sud’ (£4.00 extra) Rack of lamb roasted to pink, served with pan fried new potatoes, baby stuffed aubergine & courgette flan flavoured with cheese, lime & thyme, finished with a rosemary jus. Stunning presentation, beautifully cooked. Everything on the plate really worked. Various others went monkfish, fillet steak, all looked rather splendid and all thoroughly enjoyed. Desserts up next, loads of us including the main guests had the bread and butter pudding with rum and raisin ice cream. Others included Tarte Au Citron and Panacotta A’ La Fraise (Creamy vanilla panacotta served with a fresh strawberry & basil soup, garnished with a homemade shortbread biscuit). 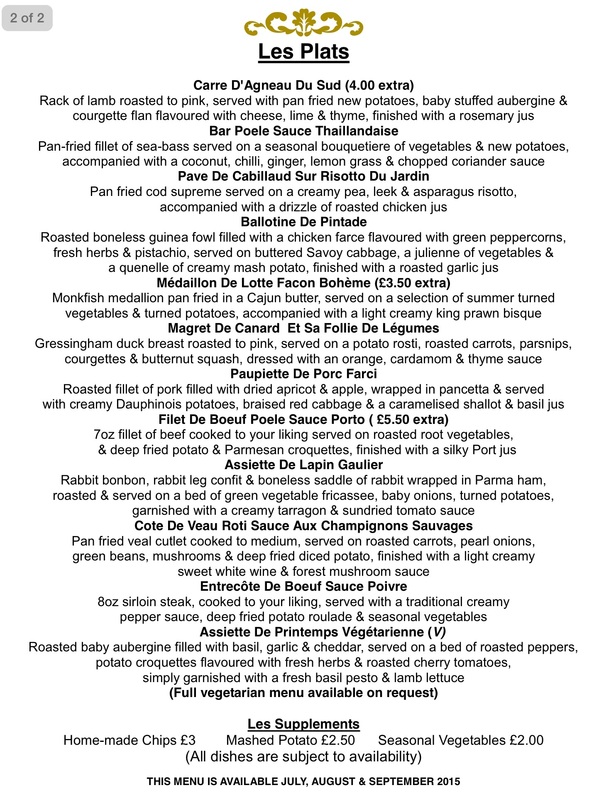 The three course menu is £28 each, though a couple of the mains add a few quid. I have to say it is difficult to imagine how value can be bettered. To have such a choice of food prepared and serviced as well as this seems to me to be nothing short of a miracle. I’m sure someone has the answers but it’s a real hats off to Head Chef Olivier Troalen and his team. He even does cookery courses on the side. Apparently he hopes to be the “Cantona of cooking”! I think he is there already. Flair, passion and quality. It’s a heady mix. 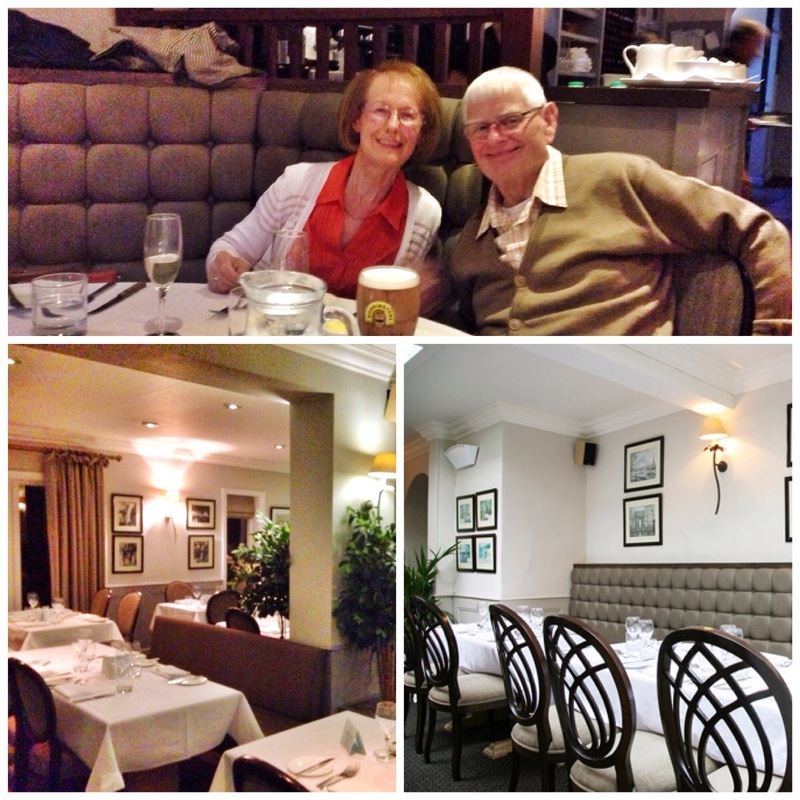 If you want a night of sheer ‘old school’ elegance get yourself and your loved one down to Lymm and La Boheme. You’ll not be disappointed.